So what to do in Ho Chi Minh City (aka Saigon). I spent 7 days here and tried to cover off most of the main things to do. As you head down any street in HCMC you’ll hear the chants of ‘Cyclo, Cyclo’ and in my case ‘Madam Cyclo, Madam Cyclo, where are you going?’. I don’t like being told what to do and I’m not great at accepting help either so from day 1 I decided to grab a map from my hotel and walk the streets to all the local places to visit. So pleased I did this as apart from the monumental showers it was a good way to feel part of the city. I’m also chuffed that I didn’t hire a guide or do a city tour as I’d have cried if I’d been made to stay longer than 30 minutes at Reunification Palace and HCMC Museum. I enjoyed the Fine Arts museum though, but being a bit of a heathen I preferred the galleries behind the Art Museum – the Spring Galleries. 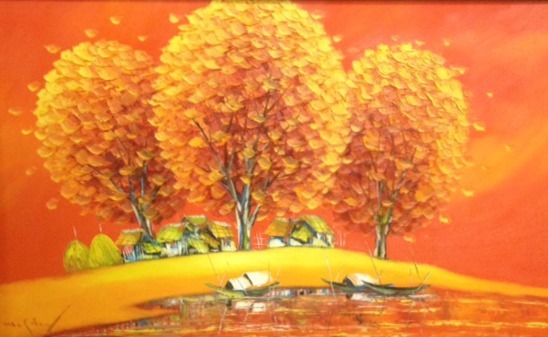 Here I discovered a fabulous artist called Sonr, who works with big bold neon colours, Linh who has painted a series of stunning flower images with water colour, Tran Kvang Dinh’s big orange paintings using lines to create depth. 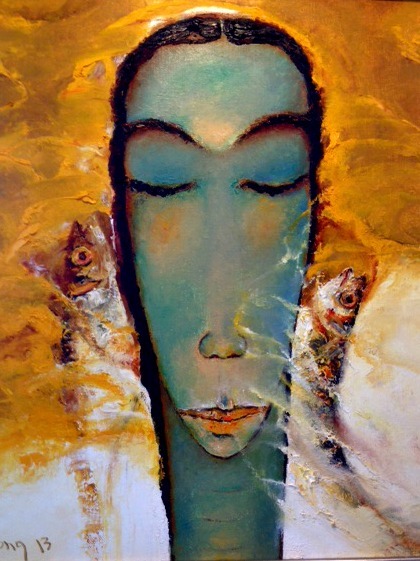 In The Lac Hong Gallery I loved ‘The Lady with Fish’ by Nguyen Tan Cuon G – it’s bold and intriguing with fish suspended beside a long melancholy face. 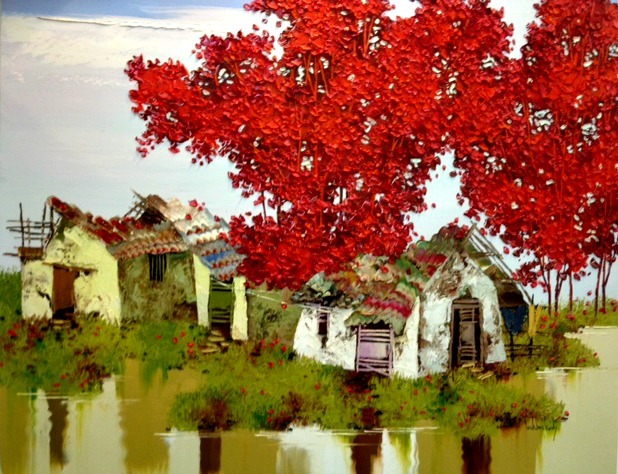 I also loved Lim Khim Katy’s oli on canvas with it’s big bold red trees. 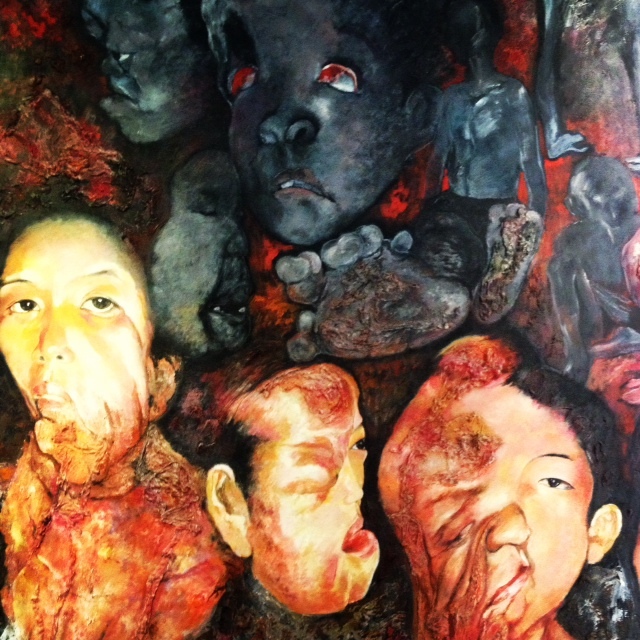 Unsurprisingly, in the slightly older work there is a strong war influence, with wartime posters, haunted faces and the more traditional lacquer paintings have army green troops etched in. A few hours out of town you can head to the Mekong Delta for a boat ride. It was okay… it felt a little like a tourist filled conveyor belt with tasting sessions, a coconut candy ‘factory’ etc. The Cu Chi Tunnels are also a few hours out of town and I can’t believe I’m not even giving this its own paragraph! But again, this experience was so rehearsed and our guide spent the majority of time cracking awful jokes (inappropriate!) that this wasn’t a highlight for me. The whole tunnels concept is incredible and the traps created were morbidly interesting, but it’s a very formulaic touristy experience with a propaganda video thrown in. Now I’d love to go to the Vietnamese tunnel entrance a few miles North of the ‘International tourist’ entrance – interesting that they’re very separate experiences. It would have been criminal not to have tried out the world renowned beauty treatments of South East Asia, so I treated myself and I’m feeling human again! Thank you Spa Tropic (District 1) for normalising me with your lush smelling lotions and potions and your smiley team. I had a few misses with the whole eating in HCMC, I’m sure there are some great places to eat but I couldn’t find them. That’s until I gave ‘Wrap & Roll‘ a go… wow! This sounds so wrong but the food was beautiful and authentic Vietnamese. You just have to ignore the staff tee-shirts: ‘It’s only Wrap & Roll, but I like it’. Ha! Ho Chi Minh City in a snapshot: Great coffee (no. 1 exporter in the last year), pancakes, cyclos/mopeds/bikes, mental rain showers with long plastic macs, traffic, haggling, sad faces, wartime, street sellers, pavement bars, backpackers. I’ve been in Ho Chi Minh City for a week now and I’m not sure whether it’s because I’m a tourist but it’s pretty difficult to escape the war in this city. I imagine the locals also have daily reminders but in different more subtle ways and of course far more impactful. I’m hearing all about the war from tour guides, looking at paintings, photos, visiting factories where the Agent Orange survivors work. It seems to be engrained into everything I’ve visited. The war is still very vivid here and the cynic in me would say it’s also not a bad way to bring in the dollar. Part of me hopes they find a way to forget and they stop having to relive the tragedies every single day, but then I guess there’s also pro’s for not forgetting and educating people to try and help prevent future wars. ← Ho Chi Minh City – A very recent war.